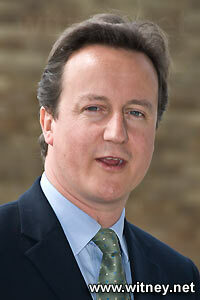 David Cameron - Previous Witney MP and leader of the Conservative party . David Cameron became the leader of the Conservative Party on Tuesday December 6th 2005 when he won 134,446 of the 198.844 (67.6%) valid votes cast by Tory party members. Cameron became the Witney MP in 2001 and was re-elected in May 2005 with 49.3% of the votes (26,571 votes, a 14,156 majority over Liz Leffman the Liberal Democrat candidate). The swing being 0.8% from Liberal Democrat to Conservative. The total turnout for the 2005 General Election was 53,869 (69% of the registered electors), a 3.1% increase from 2001. On 6th May 2010 voters went to the polls to vote in the 2010 General Election. David Cameron retained his seat in Witney and the Conservative Party won the most seats, but fell short of the overall majority need to form a new Government. A coalition Government was formed with the Liberal Democrats. In 2015 Cameron's Conservative party won an overall majority. It is announced that Cameron would resign as MP for Witney. After Andrea Leadsom pulled out of the contest to become the next leader of the Conservative Party, Teresa May was left as the remaining candidate. David Cameron announces that he will visit The Palace to offer his resignation on Wednesday 13th July and Teresa May will take over as Prime Minister. He will remain as MP for Witney. 24 June 2016 The electorate of the UK votes to leave the European Union and David Cameron announces that he will step down as Prime Minister before the Conservative Conference in the Autumn. May 2015 Re-elected Prime Minister with a majority. 25 August 2010 It is announced that David and Samantha Cameron name their new born daughter Florence Rose Endellion (St Endellion is a village in Cornwal close to where they we on holiday when Samantha gave birth). 24 August 2010 Samantham Cameron gives birth to a daughter while David and Samantha are on holiday in Cornwall. 2005 - June 13th 2016 MP for Witney and Conservative Party leader. Teresa May takes over as Prime Minister.